As Canadian mortgages come up for renewal, many households are starting to experience what TD Economics has dubbed a “completely new phenomenon” – higher interest rates. 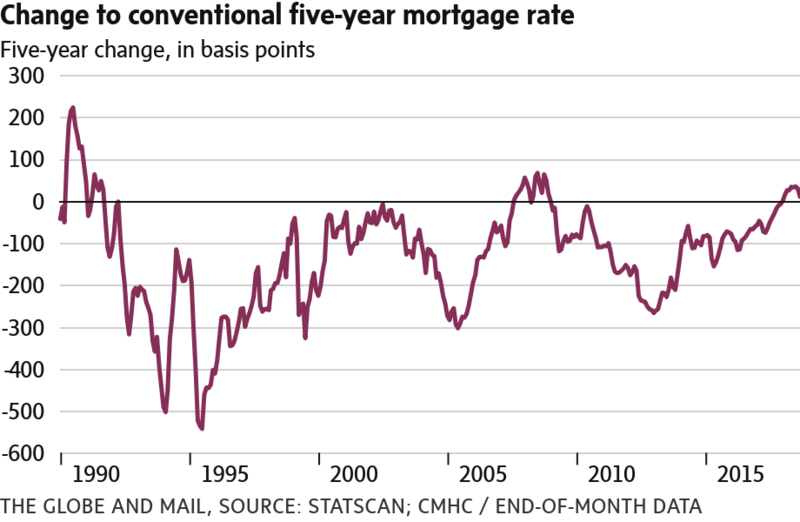 In a recent report, TD looked at the change to the conventional five-year mortgage rate over its term length. Essentially, this shows where rates for a popular product – the five-year, fixed-rate mortgage – stand upon renewal. For much of the past quarter-century, the change has been negative, meaning Canadians could expect lower rates come renewal time. But earlier this year, the difference turned positive for the first time in about a decade, a reflection of shifting lending conditions as the Bank of Canada tightens monetary policy and bond yields head higher. Rates are still low by historical standards – the five-year rate was 4.43 per cent at the end of September, or 10 basis points higher than five years ago – but they are climbing. “About a quarter of fixed rate mortgages come due for renewal every year,” TD economists wrote. “So, in about four years’ time nearly all households with a fixed-rate mortgage will face a higher interest rate.” That represents a big chunk of the mortgage market. Most Canadians take out fixed-rate mortgages, surveys suggest, and five-year terms are common. The mortgage rate used in TD’s report comes from the Canada Mortgage and Housing Corp., and is the average of the posted, five-year fixed rates for mortgages issued by banks, trust companies, credit unions, savings and loan and life insurance companies. Many homeowners lock in lower mortgage rates, but the posted rate can serve as a starting point for negotiations. And of course, the negotiated rate comes down to a household’s financial situation. Regardless, the positive turn for rates suggests the mortgage market has entered a new era – and one that costs Canadians more.